Ghost dreams of acquiring the famous kitty. As cunning as a fox, he might get his way. Ghost is still moving towards the Special Kitty. When he fires, he hits all the Bandits within range and loses the Special Kitty to the Bandit who eventually possessed it. If, at the end of the game, the Special Kitty is in Ghost's possession, he automatically wins the game. The principle of each of these mini-expansions is to play a Bandit by the game itself. A new story is written each time, because each mini-expansion has a goal and specific actions for the Bandit played by the game. This Bandit can win, and in this case, no player around the table wins. We must therefore unite against this "automata" bandit, not to mention that there is only one winner, the richest, of course. Each of the following mini-expansions is played alone, with the basic Colt Express game. They are not compatible with each other or with other existing expansions. Be careful this game is an extension of Colt Express ... + 2 more+ 2 more and cannot be played alone. 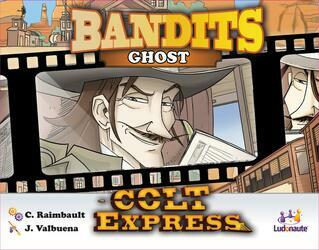 To be able to play it you must have a copy of the game Colt Express ... + 2 more+ 2 more.